Well, Santa Rosalia actually. But no one has written a popular song about being stuck in Sant Rosalia. It is often said, and correctly so I believe, that cruising is working on your boat in exotic locations. Santa Rosalia, a dirty, blue collar copper mining town, is hardly exotic but it certainly meets the intent. We wheeled (?) into town Saturday, July 5th with an ailing watermaker. As we intend to continue into the very remote Bay of Los Angeles next and the boat only holds 100 gallons of water, having the watermaker working correctly was important. If we couldn’t get it fixed we would have to consider a new plan. There had been some disagreement between Judy and I over just how long to stay at SR but now the issue was settled. We would have to stay until we either repaired the watermaker or knew we couldn’t. That has turned out to be two weeks. Well, two weeks as of tomorrow, that is. As always, there was a project list as well as the WM issue to keep us occupied. Most of those items got handled and, at least eventually, so did the watermaker. So, we are ready to go. What we finally figured out with the watermaker was that everything worked correctly until pressure was introduced to make water. At that point, the pump seemed to begin failing. It was reluctant to reach normal pressure and, when it did, the pressure was pretty unstable. Then, the amount of water being pushed through the system was waaay below normal with the consequence of raising the salinity of the water being “made”. It didn’t make any sense but there it was. Repair parts were sent via FedEx but they failed to do the trick so a whole new pump was dispatched. After a wrestling match with mounting the 12volt clutch pulley to the new pump that lasted several hours, we were finally able to test run the system yesterday afternoon. And it all worked great – 56 gallons per hour of water cleaner than any city water you’re likely to find. Yay!! This might be a good time to say something about the folks who make this watermaker. Rich and Charlie at CruiseROwater are absolutely the best. Always available to us customers, these guys might have just as well been right here with me troubleshooting every step of the way. Rich even drove parts across the border to ship them from Tijuana so they would get to Sta. Rosalia faster. Thanks guys! Around about 0300 – 0400 tonight we should begin our journey North to the anchorage at San Francisquito. It will take at least 15 hours but could be longer if the wind gods are less than helpful. Regardless, by leaving so early we should be able to reach the anchorage well before sunset. As Sta. Rosalia is the furtherest North we’ve been, every mile traveled and anchorage visited for the next month, or so, will be new territory for us. The reports claim the BLA is remote but nearly teeming with wildlife (sealife?) so we are excited to get to see it. It’s always good to have a photo or two to share but shots of me working on the boat or photos of the boat torn apart with tools spread everywhere seemed sort of lame. So, instead, here are a couple of photos that might be a bit more interesting. On our last leg (San Nicholas to Sta. 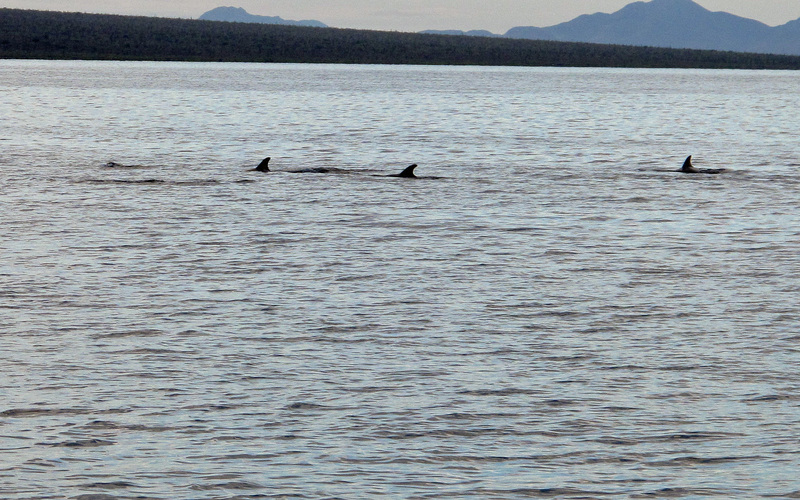 Rosalia) we were accompanied for a time by a small pod of maybe 6 Pilot Whales. 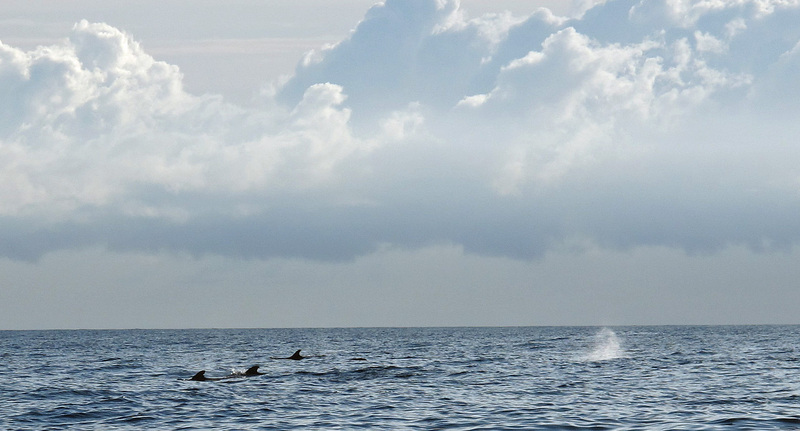 No, they aren’t dolphins, they’re for real Pilot Whales. Ha, ha. Yes, Behan, they ARE still here, and they’re still as good as you remember. We enjoyed more of them than we probably should have. Glad the watermaker is fixed and that you are on the move to new territory. Enjoy!